Its ability to play basically any song from any music genre makes it a great fit for people who are looking to learn the basics. The question that remains, however, is what are some of the best acoustic guitar songs for beginners? Not every song below is originally played on an acoustic guitar but all can be played on an acoustic and sound good on an acoustic guitar. This is one of the more simple songs to learn – and if you’re wanting to be able to sing along whilst you play this is a great place to start. There aren’t too many chords to remember and once you have the Rhythm for the chords down for this song, it’s something you should be able to play without thinking about it, so you can concentrate on singing. Watching the video below should help you to see this song played as well as the written chords and lyrics. Mostly performed with chords E through A and key E, this song is another great choice for an acoustic guitar. The artist performing it is Robert James Ritchie, better known as Kid Rock, who does everything from rapping and acting to songwriting and producing. The song begins with the sound of the guitar that comes stronger than other instruments throughout the tune. If you want to play this just as Johnny Cash did, it might take a little longer to learn (but by no means overly difficult) but to learn the basic chords, this song is nice easy one to learn, so you can you should be able to be playing this one quickly. Below is a simplified way to play the song. If you’re just starting out on guitar, this is a great place to start with this song. You would not believe my credibility if I fulfilled a list without a single song by Elvis Presley, right? Enter the “Hound Dog”! Regardless of your status, you probably heard of this singer at some point. It pays off to learn at least one of his tunes as it can be impressive for the crowds. The chords utilized here are C, G, and F which will make it pretty simple to catch a pattern. Once learned, you will be singing Presley’s words in no time! Made in the second half of the 20th century, this Southern anthem echoes pride and power. It is also one of the best-known songs you could ever perform with your guitar. When you become skilled at hitting D, C, and G chord, you will have people praise your guitar-playing skills left and right. If you do not believe me, listen to the song yourself and experience the rhythm. 90’s band Blind Melon released this, their biggest hit, in 1993 and endures as an acoustic rock classic. It’s a great song for beginners to learn because it incorporates some single note picking, which isn’t too difficult but goes beyond simply strumming chords, to add to your repertoire. 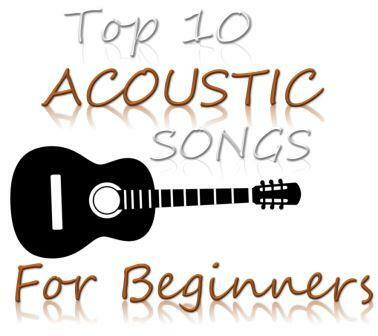 To complete the list of the best beginner acoustic guitar songs, Audioslave must be entered. Their song “Doesn’t Remind Me” is an E-A-D-chord tune that might be a quick learn for the majority of the beginners. This is because it is a very calm and relaxed melody that picks up a little during the chorus. Nevertheless, a couple of days of practice and you should see how natural this song will feel to your hands on your guitar. Just skip learning the solo for now – that’s a more advanced skill to master there! Ultimately, any of the songs I listed can be an effortless performance if you give it time. There are, undoubtedly, more songs to be placed on a best beginner acoustic guitar songs list, but these are a great starting point. Playing an instrument is a skill that requires both sides of the brain to engage as well as multitasking skills that most people do not possess. Therefore, if you are willing to dedicate to the learning process, you will be rocking “Sweet Home Alabama”, “Born Free”, and more similar songs before you know it!